This book was primarily written to allow those closest to the author to understand what goes on in her head when she is having an episode of hypo-mania and Depression. The book is filled with funny anecdotes, thought provoking statements and some poetry thrown in for good measure. 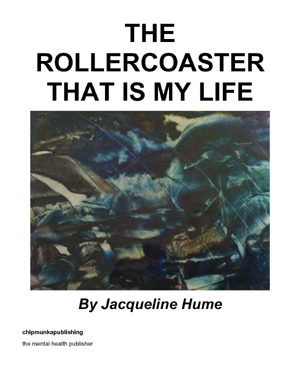 Jacqueline Hume was born in Ayrshire in 1972, had a pretty uneventful childhood and left school when she was 16 with a bunch of O levels. She floundered into doing my Mental Health Nursing in Dumfries and after her training moved to Glasgow where she took up a project worker position within a community project. It was at that time she tried to kill herself and ended up in hospital for the first of many admissions. She was diagnosed with rapid cycling bi polar affective disorder. She has managed to stay well and medicated for 10 years, she even managed to work for 5 of those. She had a wee blip last year but is well on the road to recovery now and is looking forward to what the future holds for her. This started out as a mood diary because I got sick of repeating how I felt to the multitude of health professionals I have had to see in a very short space of time. I think at this point in the proceedings I should explain a little about myself and my illness. I don’t intend to bore the reader with tales of a battered childhood because on the whole it was pretty uneventful. I experienced the usual traumas of adolescence and didn’t have a clue what I was going to be when I left school. I ended up going to work in a nursing home and from there went onto do my Mental Health Nurse training. I ended up moving to Glasgow where I started a local mental health project which exploded into something much bigger than I could have ever imagined and consequently I ended up having my first admission to hospital with severe depression and attempted suicide. It was a humiliating, humbling experience that was repeated several times until the doctors hit on the right combination of medication – Lithium – and my bloody mindedness to stay out of hospital and get back to normality. I never did get much benefit from being unwell. The diagnosis I was given was Rapid Cycling Bi-Polar Affective Disorder. For the uneducated this means that basically I can go between Mania and severe Depression several times a day. I don’t have the luxury of prolonged bouts of either state and so I have to literally take each day at a time because I never know what mood I am going to wake up to. As the medication and heavy sedation kicked in, my moods stabilised and I was able to live a fairly normal life for a good 10 years. I even managed to follow my dream career in theatre, I worked in touring theatre for 5 years, which incidentally worked in the illness’ favour – I would work for 6 to 8 weeks then have a couple of months off to recover, then start all over again. The trouble started when I decided to become domesticated and get a full time job. Whether it was due to the stress of working 37 hours a week constantly or the stress of routine I will never know. What I can say is that 2009 will be a year to remember because for the first time in many years, I have found myself back in my hamster wheel, running from High to Low, constantly, two or three times a day and suddenly my future is uncertain and I am having to re-learn how to live with the constant swings and also how to deal with the health professionals that are trying to help me. The aim of this book is to give the reader an insight into what my life is like living with rapid cycling bi-polar disorder. I have included pieces of work that I have written when I have been Manic and when I have been depressed along-side my mood diary. This is cathartic for me, I do not condone a way of life, I am merely writing about mine and how I cope and aim to return to normality once my mood swings have stabilised. My writing is frank and blunt and I will not apologise for that, there is too much waffle and bull in this world and I have not nor will I prescribe to it. So please sit back and enjoy the ride. Remember you can put the book down and dip in and out; I live with it every day! Welcome to my world. I wrote this one night when I couldn’t sleep – It’s an idea for a short film that reflects rapid cycling.